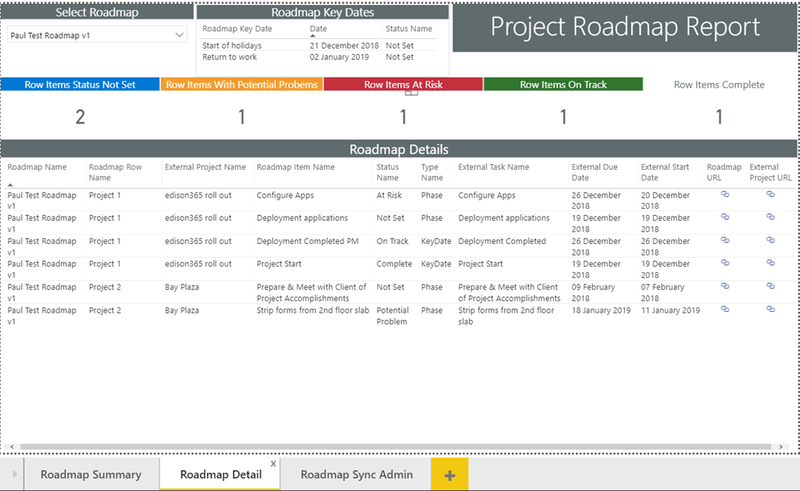 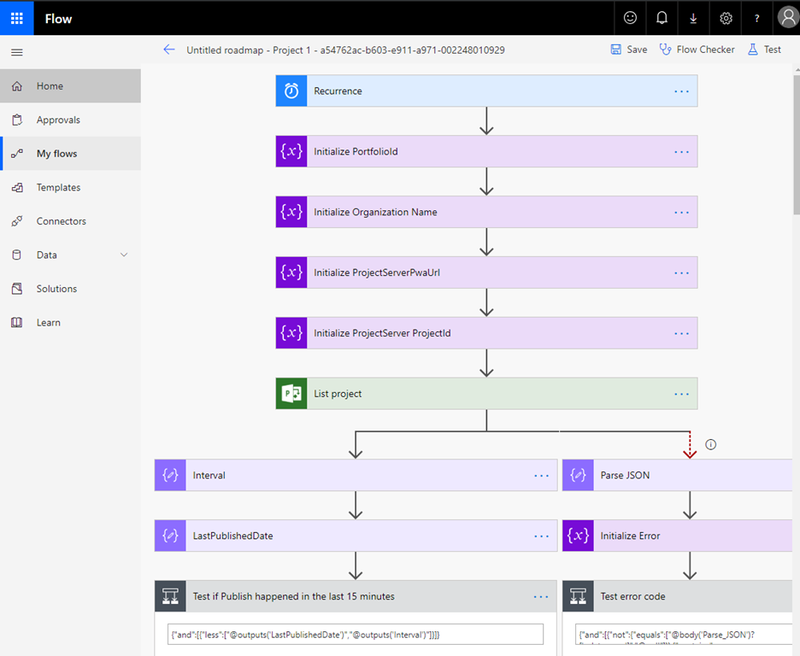 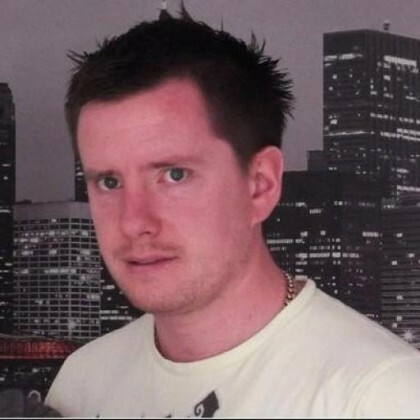 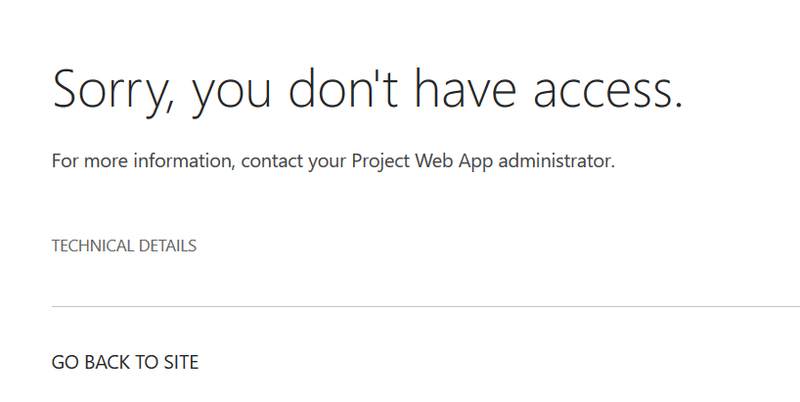 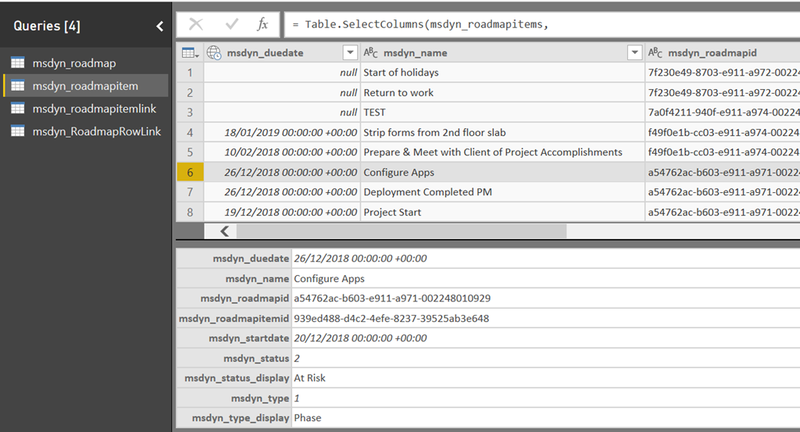 This post follows on from part 1: https://pwmather.wordpress.com/2019/01/01/project-roadmap-cds-app-overview-ppm-projectmanagement-msproject-projectonline-office365-powerplatfom-dynamics365-part-1/ In part 1 we had a quick overview of the solutions used in the CDS app for the Roadmap service. 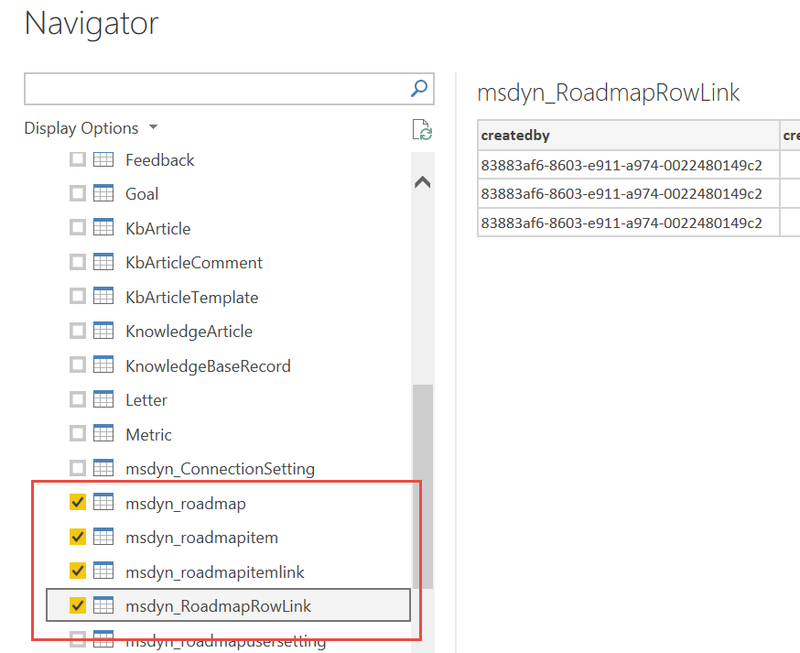 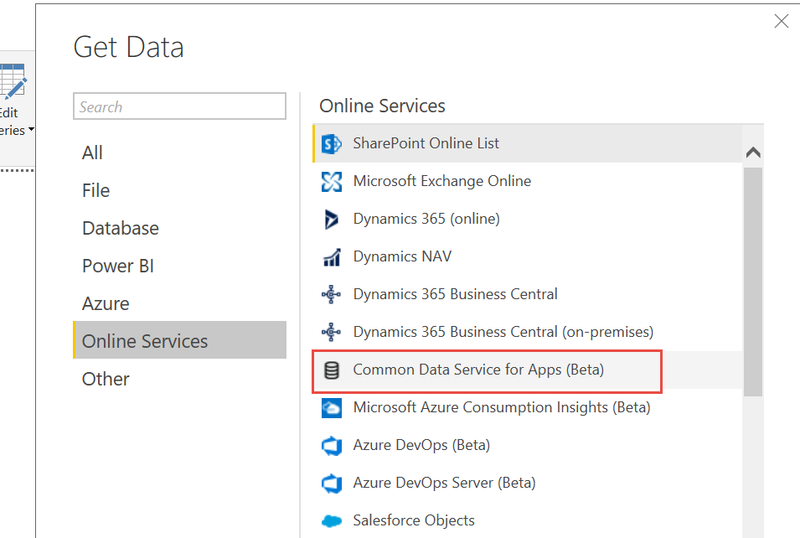 In this post we will look at the fields used by the Roadmap service and take a look at some of the data in the Portfolio Service CDS database. 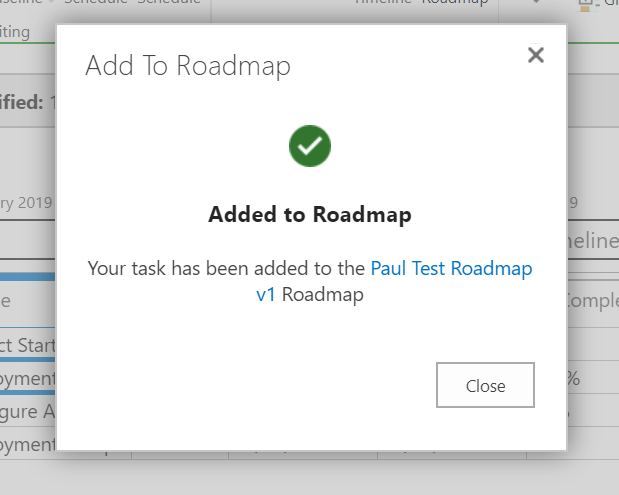 As you know, this new feature is known as Roadmap to the end users, but the backend is known as the Portfolio Service, hence both names being used here. 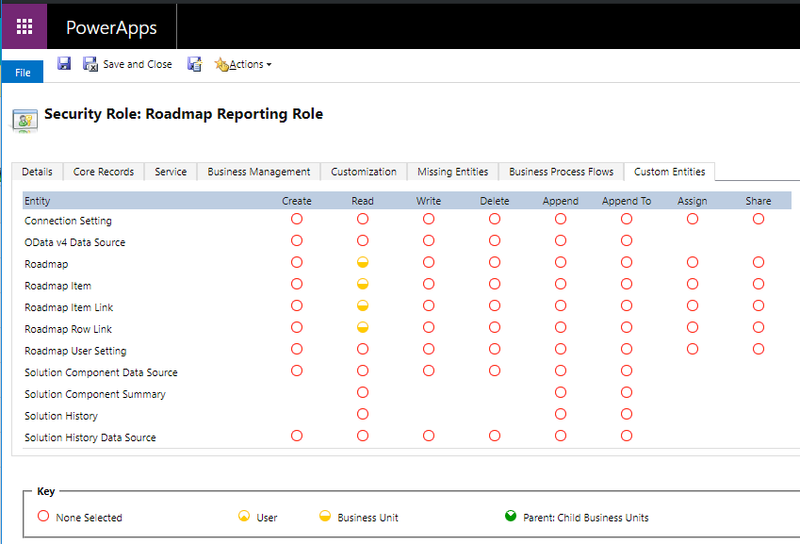 As you can see from the screen shot above, there are 6 entities deployed in the Portfolio Service solution. 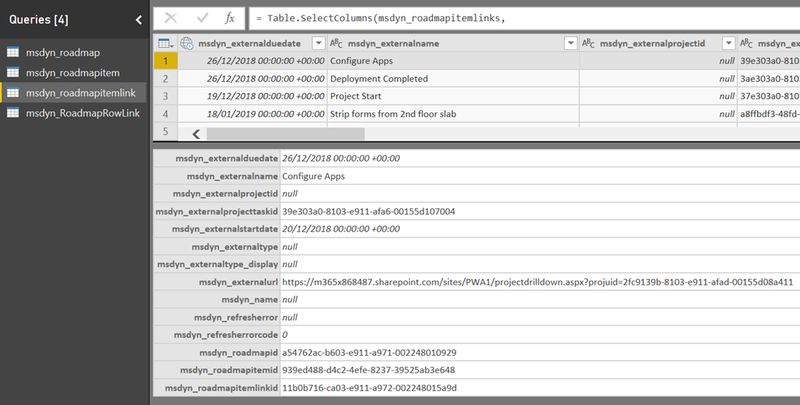 Each of these entities have various other artefacts such as views, keys, fields etc. 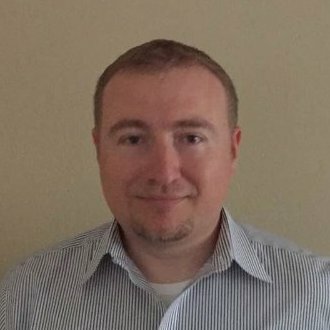 For this post, we will just look at the fields. 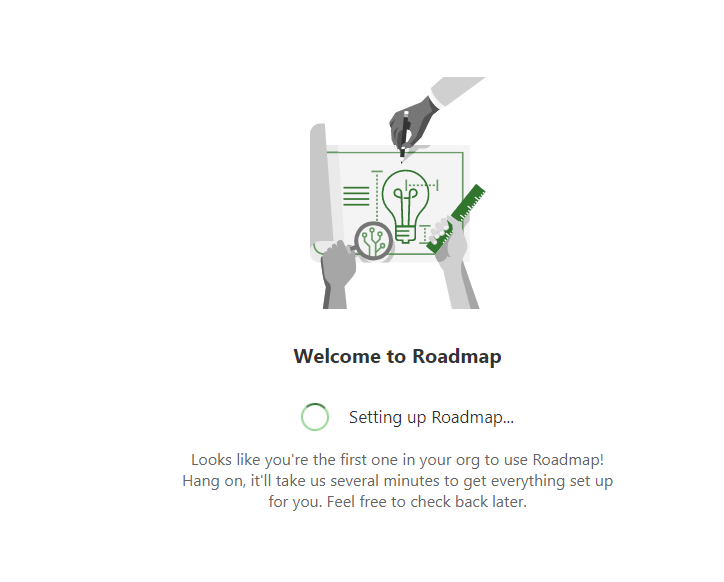 We wont explore all of the entities or all of the fields in each entity, but we will look at some of the key entities and fields used by the Roadmap service. 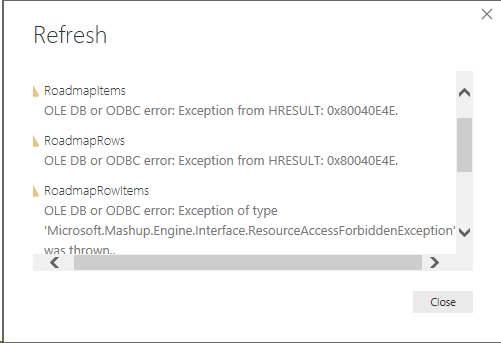 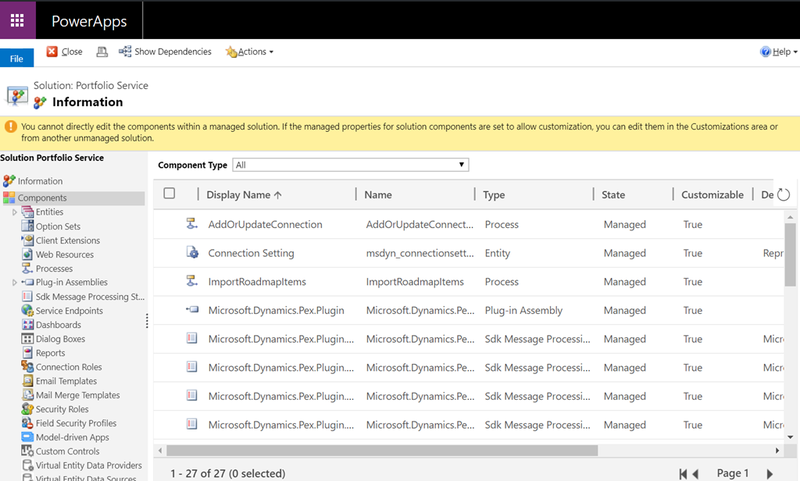 msdyn_status – this is the status for the item such as At Risk, On Track etc. 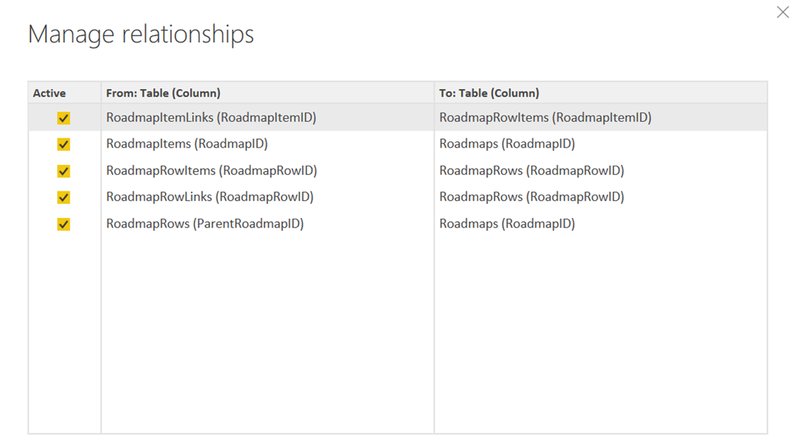 To easily make sense of the data you need to format the JSON. 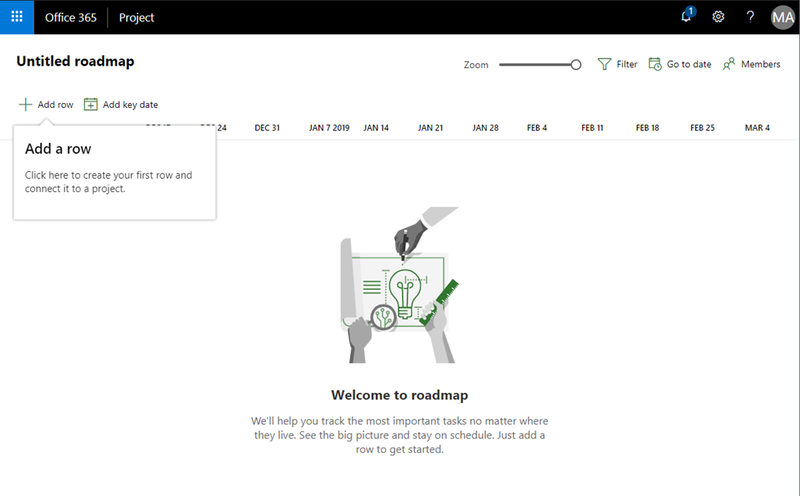 Power BI is easier to visualise the data. 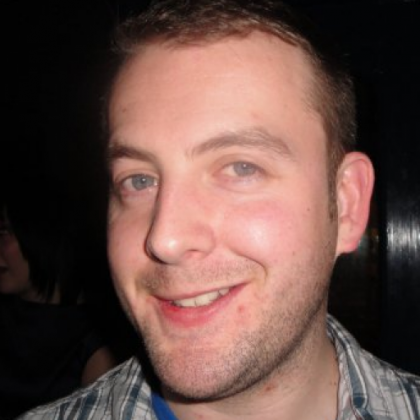 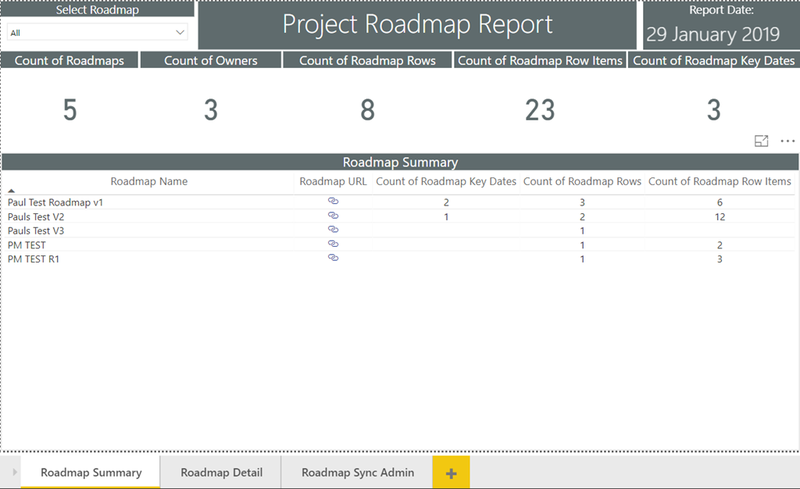 In the final part of this mini series, we will look at following on from this and creating a simple report in Power BI for the Roadmap data and bring in some Project Online data. 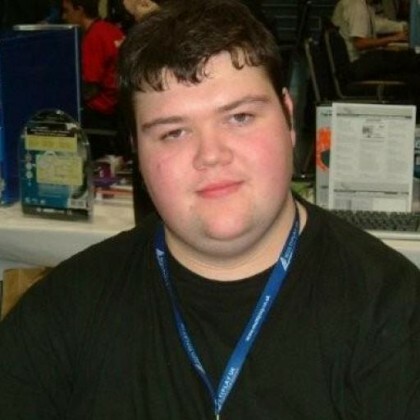 We will explore the fields in part 2. 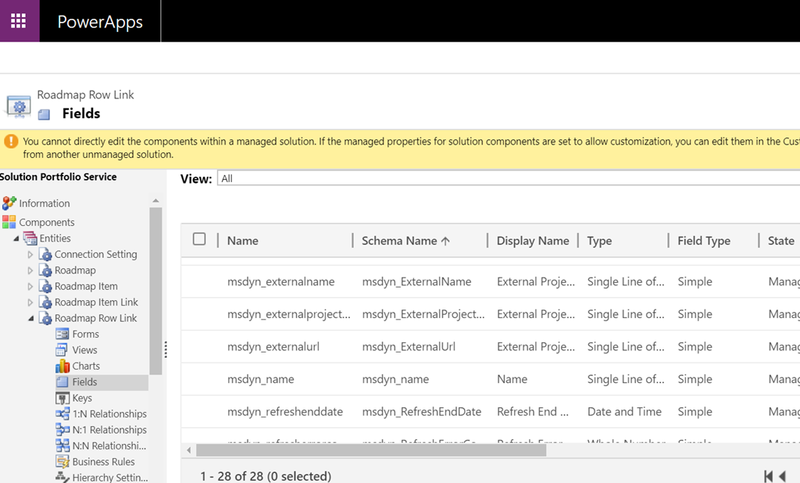 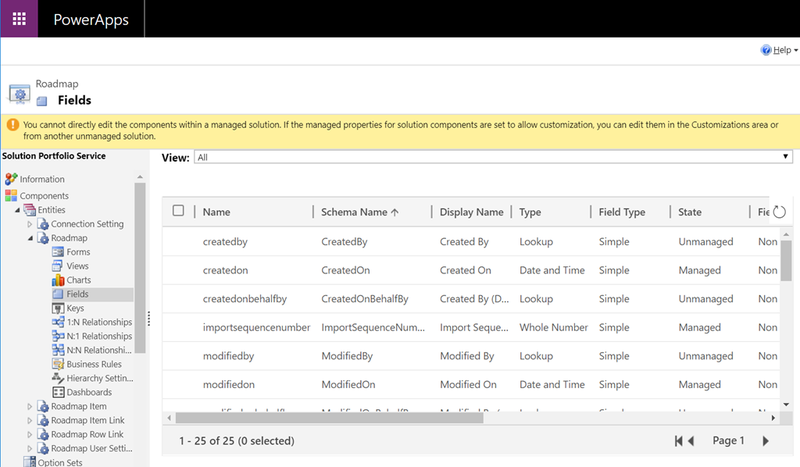 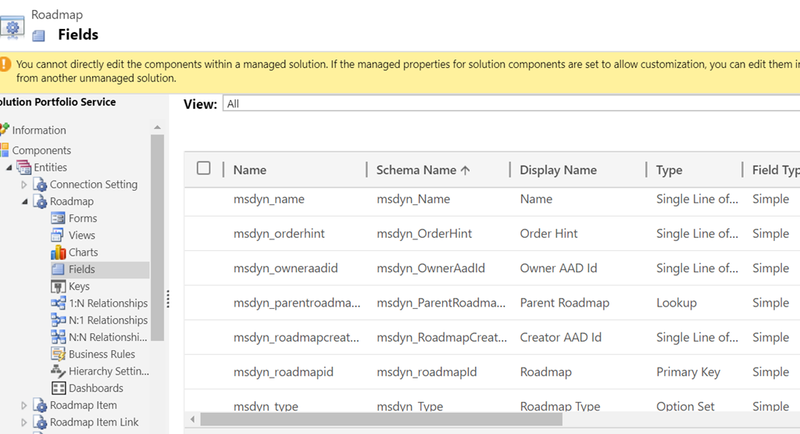 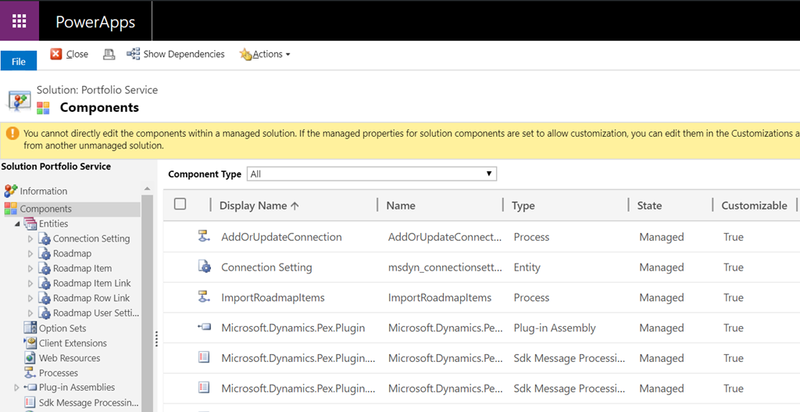 You will notice the status bar informing us that we cannot edit components that are within a managed solution, these are managed by the Portfolio Service solution. 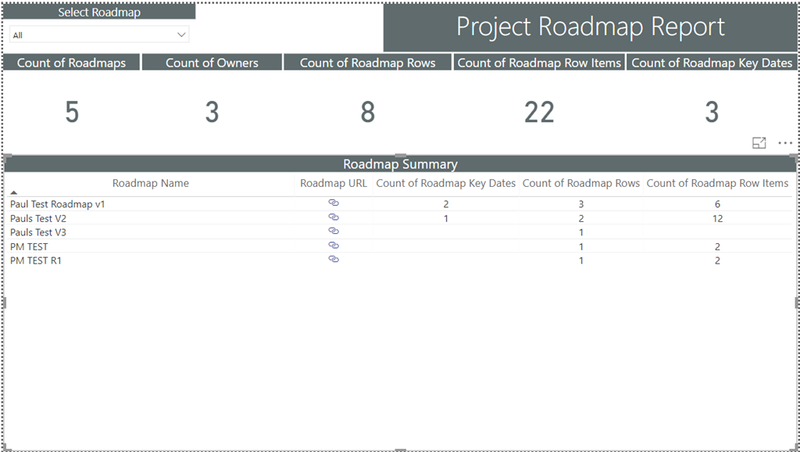 In part 2 we will look at the fields used by the Roadmap service and the data in the CDS database for Roadmap. 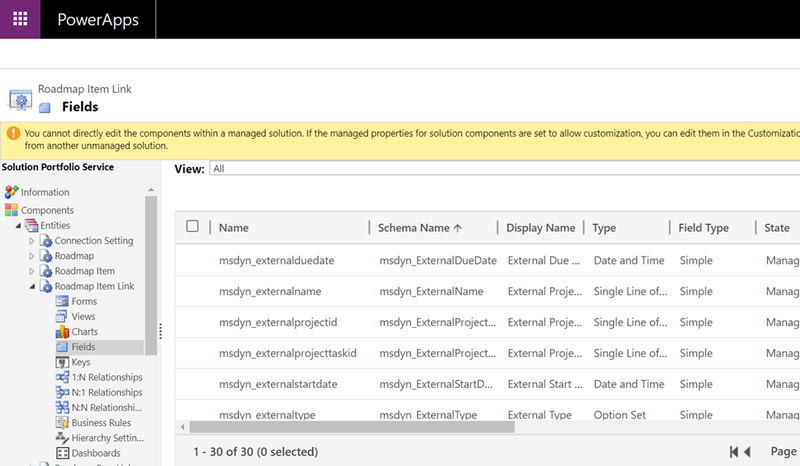 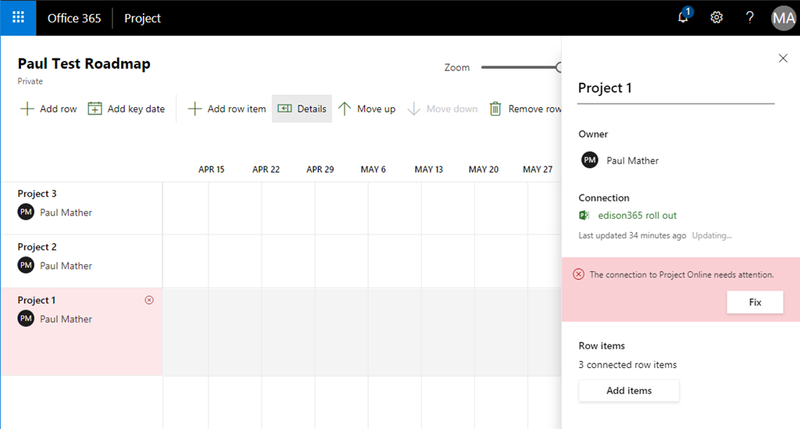 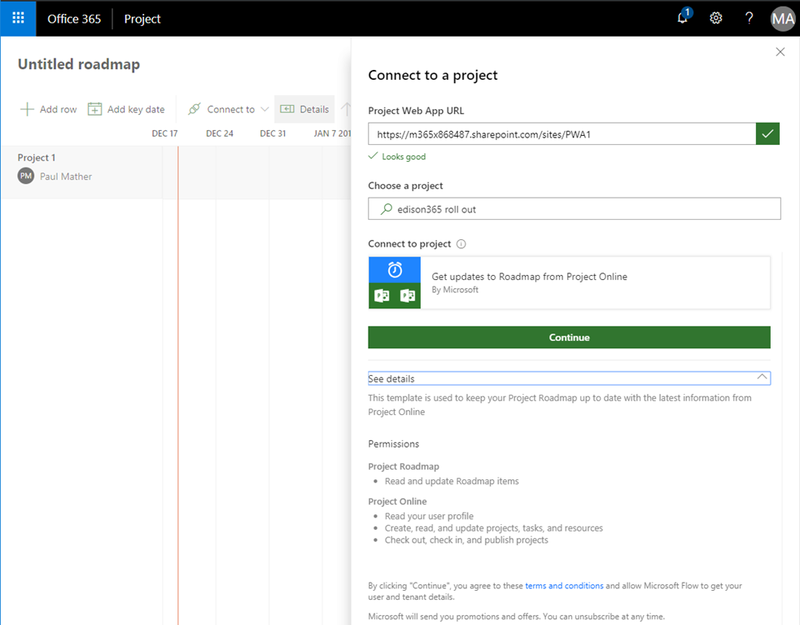 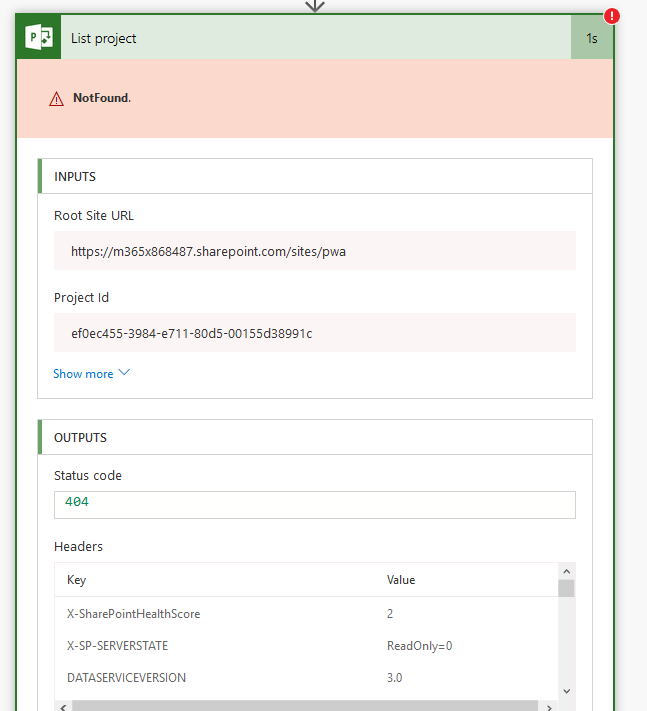 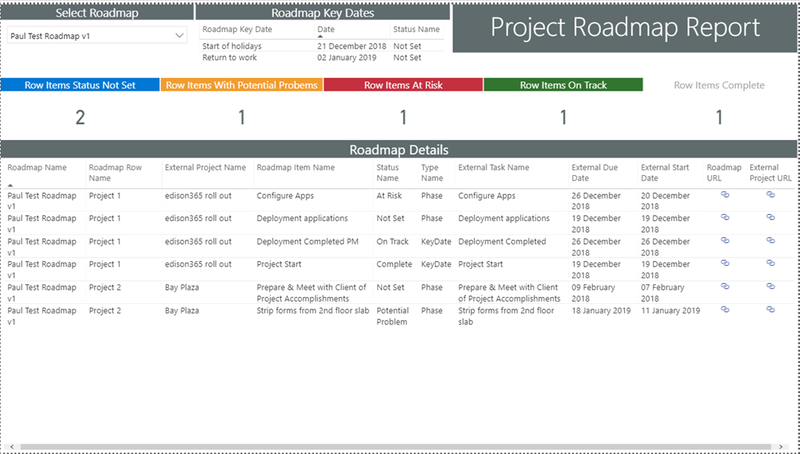 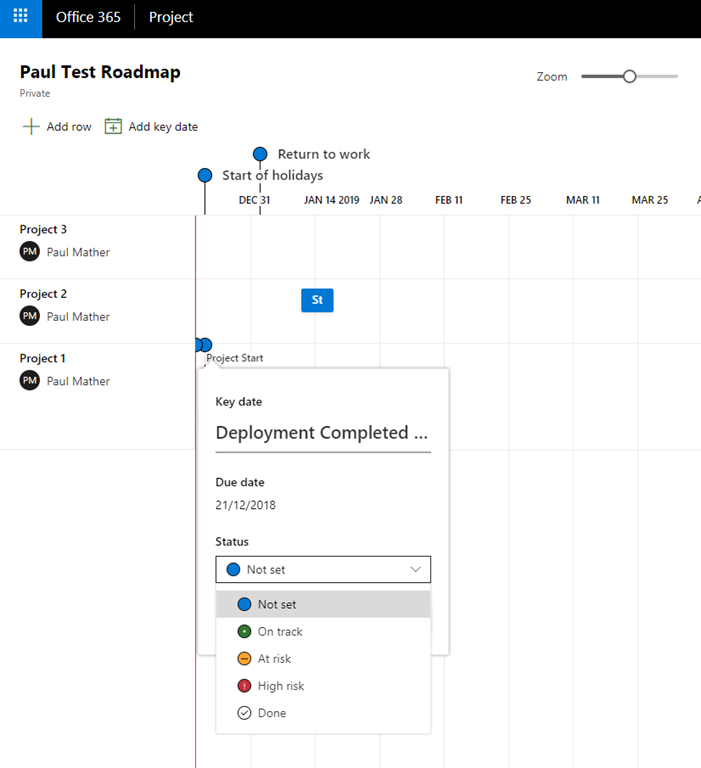 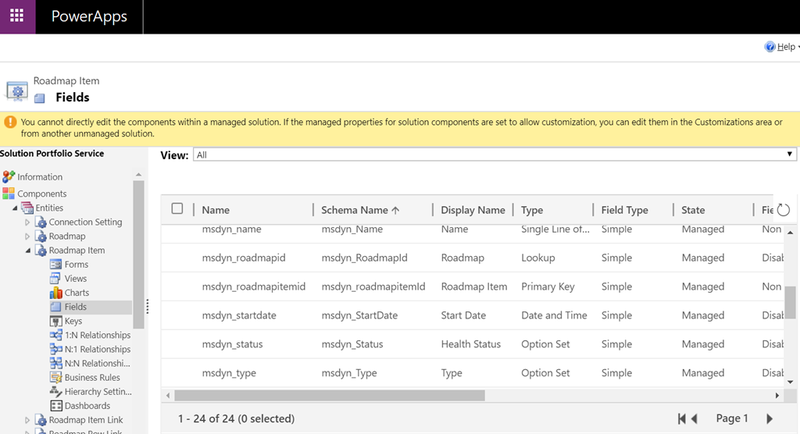 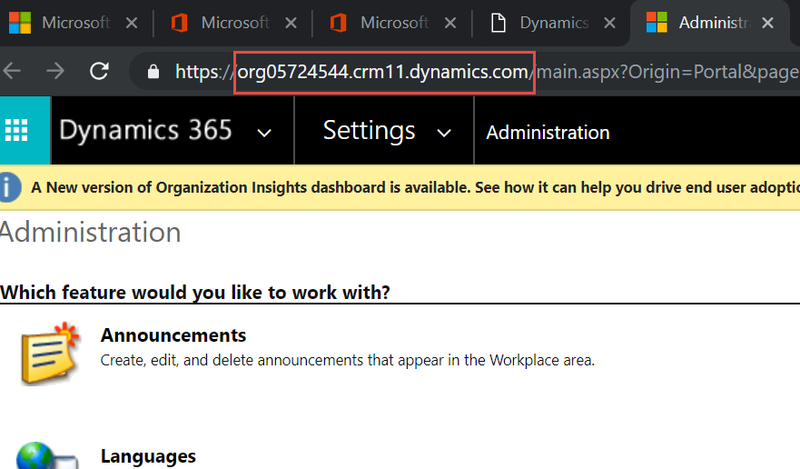 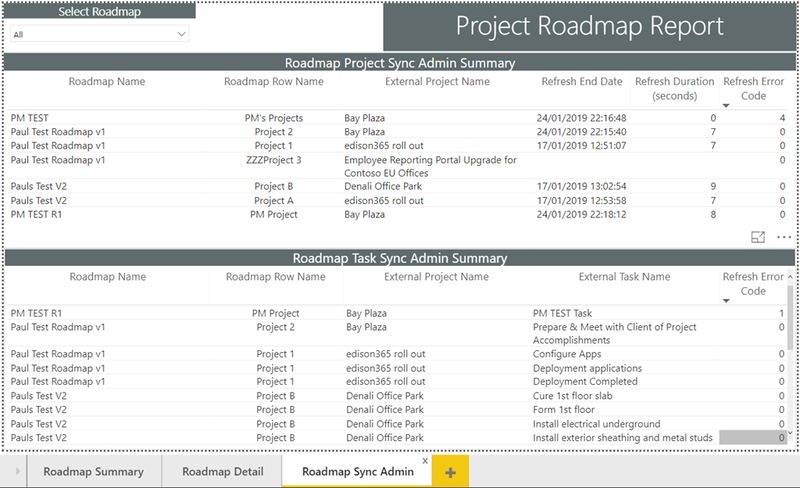 Notice in the right hand panel, you can see the last time the project was updated – this is the last time the project was synchronised to the roadmap database using Microsoft Flow. 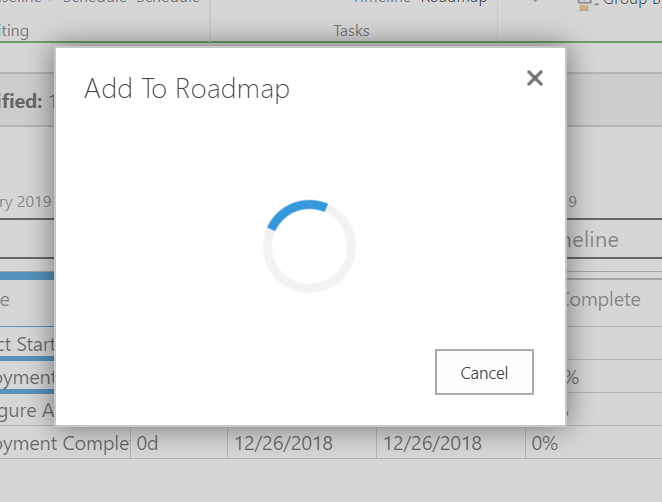 This happens every 5 minutes but you can trigger it manually by pressing the update button. 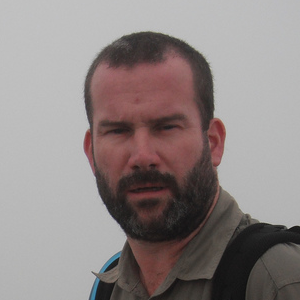 We will look at the Flow later on. 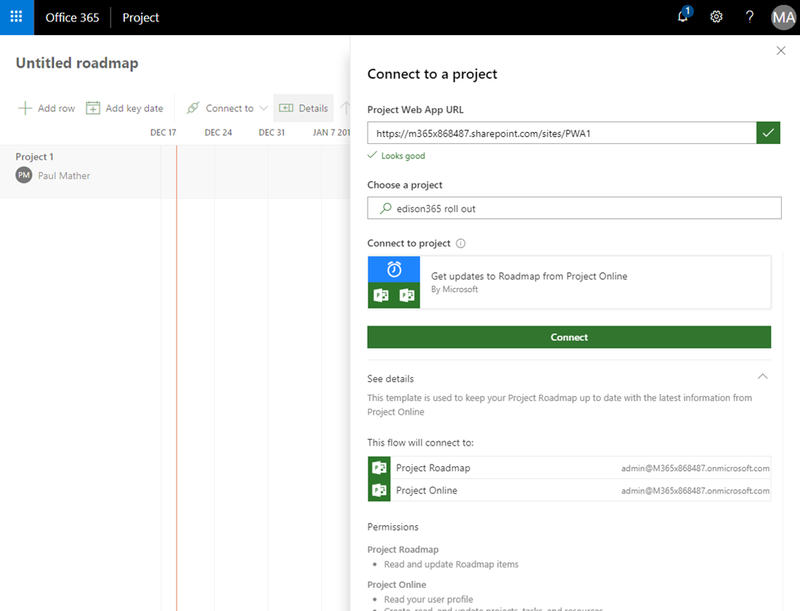 In the right hand panel, you can also click the project name, this will link to the Project Detail Page for that project in Project Online. 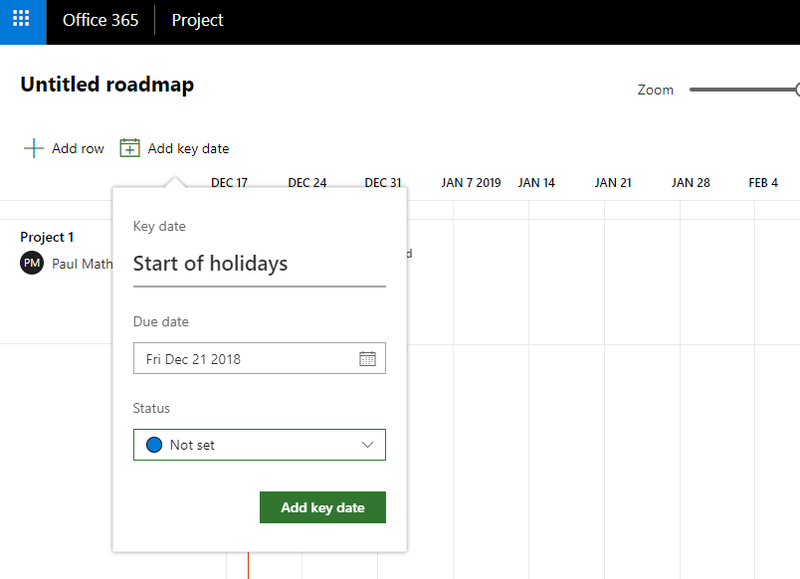 You can access this project panel by either clicking the row title or selecting the row then clicking the Details button above the timeline. 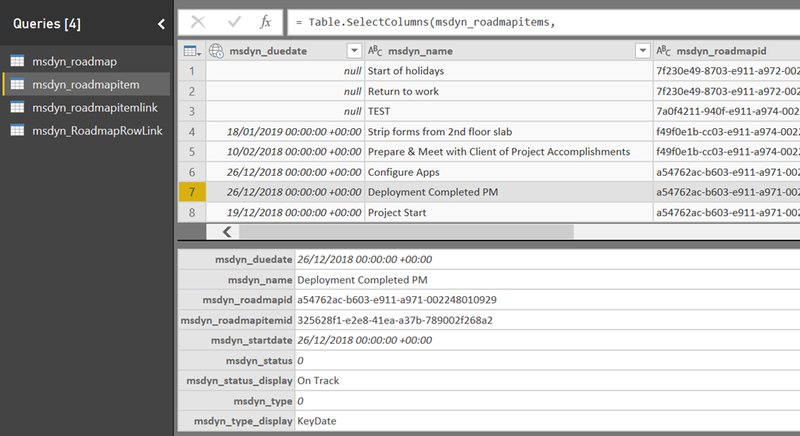 Key dates can be anything from key business dates to dates when a product is due to ship, it is just a way to visualise important dates for the roadmap. 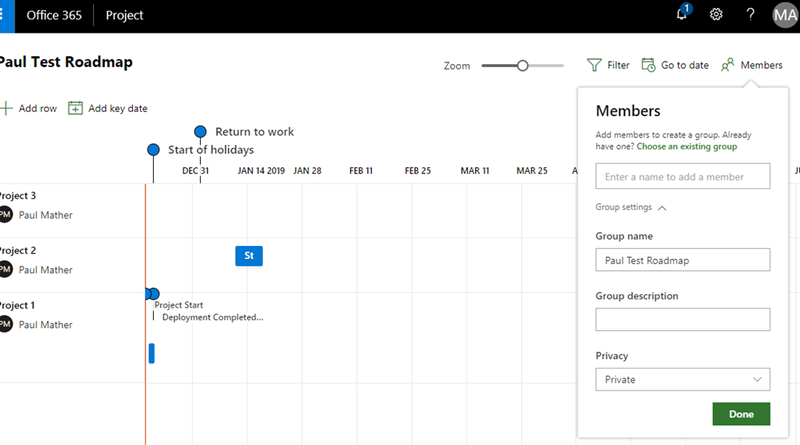 Multiple rows can be added, you can have different rows linked to different PWA instances or different Azure Boards. 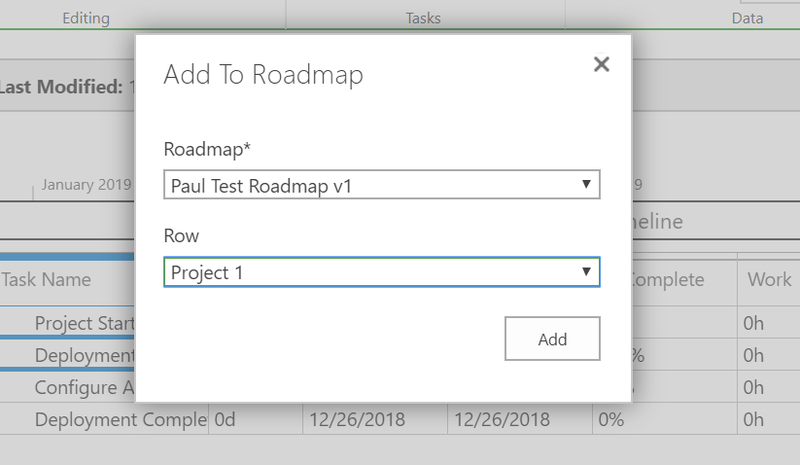 The row order can be changed using the Move up or Move down arrow buttons above the timeline when a row is selected. 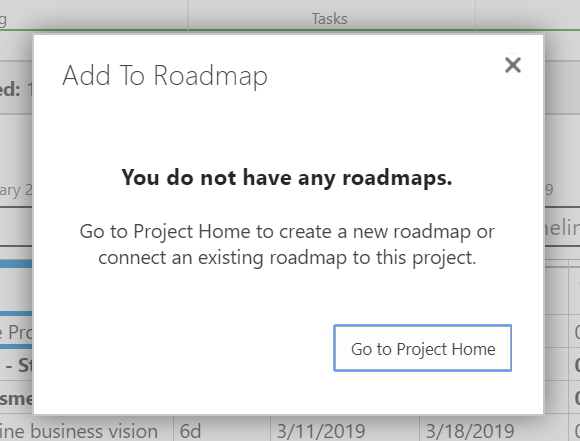 You can create many roadmaps from Project Home, linked to different projects and different Office 365 groups. 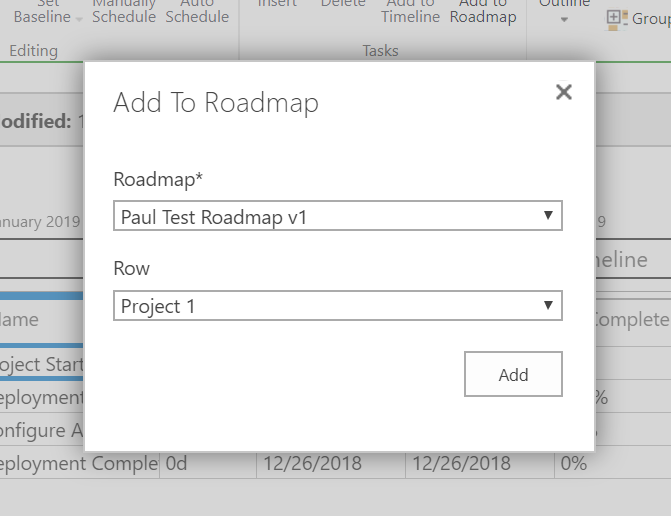 If you wanted another user to access your roadmap, copy the URL link once you’ve accessed the roadmap then send then the URL, just ensure they have been added as a member to that roadmap. 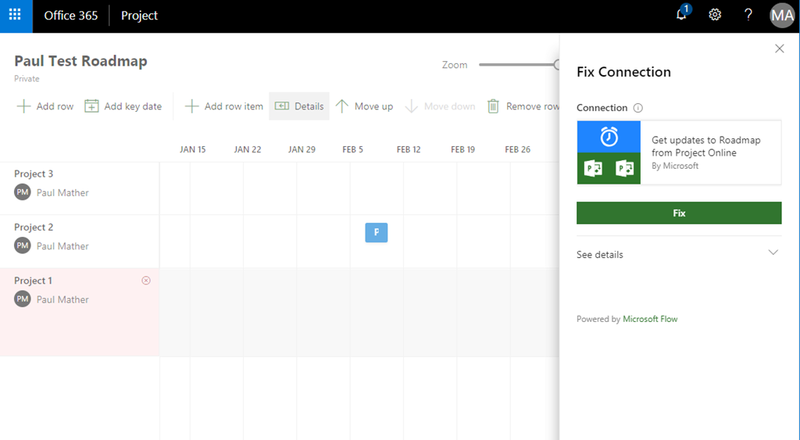 Click Fix and the Flow will be redeployed. 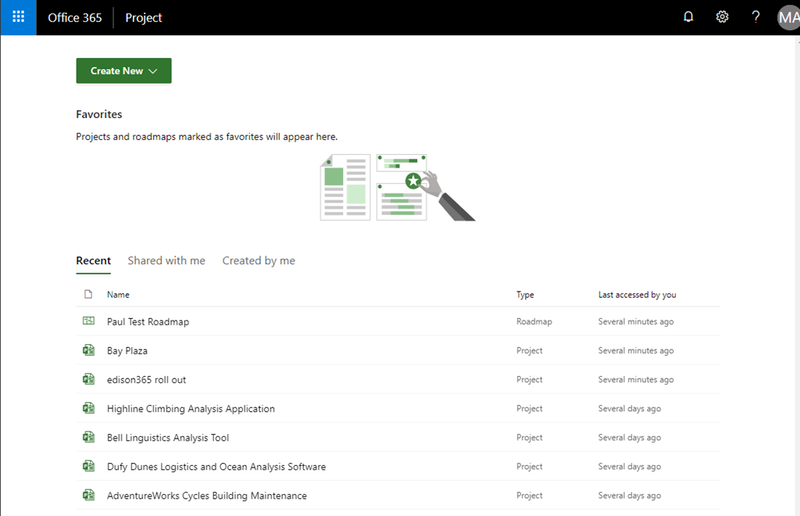 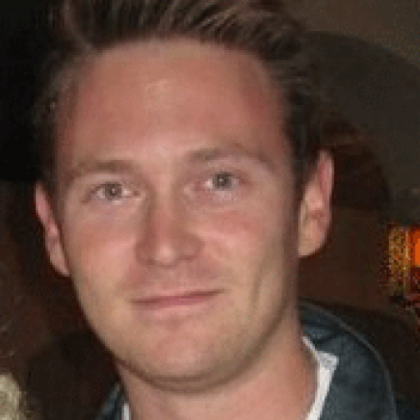 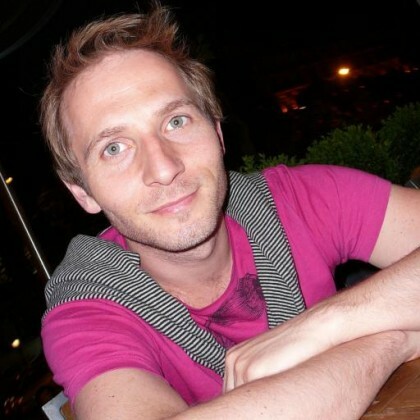 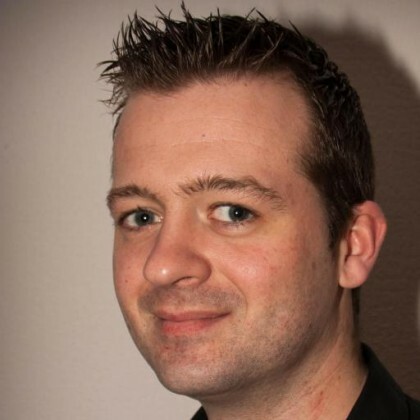 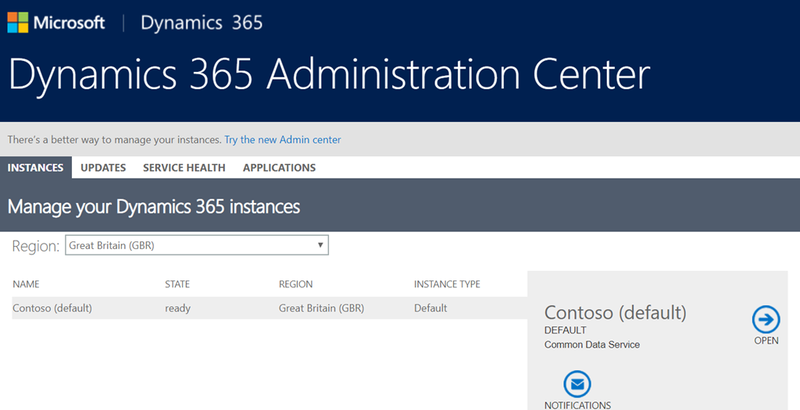 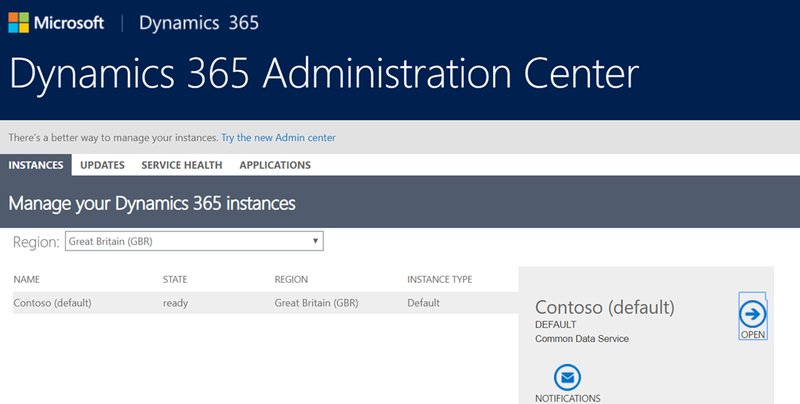 That’s it for this post – a great addition to the Microsoft PPM offering.